The Edmonton Valley Zoo has an award winning Enrichment Garden on site that allows the Zoo to grow its own food. The Enrichment Garden grows a healthy variety of fruit and vegetables. Heirloom or natural varieties are preferred as they contain less sugars, similar to food found in the wild. The enrichment garden also grows herbs used in scent enrichments. An enriching environment is one where the animals are introduced to objects, sounds, smells or other stimuli that enhance their lives. 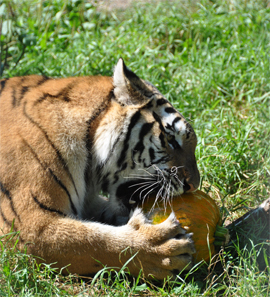 Enrichments at the zoo are often food based. Staff and volunteers at the zoo grow enrichment food in our very own on site Enrichment Garden. The Enrichment Garden is conservation in action! The zoo uses its own compost, water catchment and organic methods of gardening. The Edmonton Valley Zoo would like to thank Salisbury Greenhouse for generously donating plants to the garden.